Over 160 years ago, a wee Skye Terrier was about to become the most famous dog in Scotland’s history. 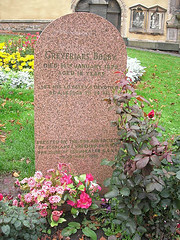 Greyfriars Bobby is a remarkable story, and a heart warming tale. On 15th February 1858, in the city of Edinburgh, Scotland, a local man named John Gray died of tuberculosis. Gray was better known as “Auld Jock”, and on his death he was buried in old Greyfriars Churchyard. Bobby, a wee Skye Terrier, belonged to John, who worked for the Edinburgh City Police as a night watchman, and the two of them had been virtually inseparable for approximately two years. Although dogs were not allowed in the graveyard, the people rallied round and built a shelter for Bobby and there he stayed, guarding Auld Jock. FOR FOURTEEN YEARS BOBBY LAY ON THE GRAVE, LEAVING ONLY FOR FOOD. 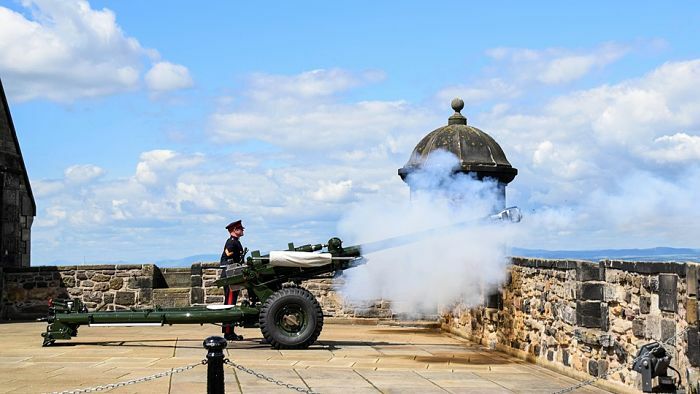 As the firing of the one o’clock gun sounded from Edinburgh Castle each day, he would leave his post, and run to the eating house which he had frequented with Auld Jock, and then he would return to Jock’s grave. The news of Bobby’s loyalty soon spread, and people would travel from far and wide to see him. Crowds would gather for the firing of the gun, to see him run for his midday meal. In 1867, the Lord Provost of Edinburgh presented Bobby with a new collar, which is now on display. The collar has a brass plate inscribed with the words…. Bobby was well cared for by the people of Edinburgh, but he still remained loyal to his master, and he continued to stay faithfully guarding Auld Jock’s grave for all those years, until he died on January 14th 1872, aged 16 years. Bobby was also buried in Greyfriars Kirkyard, just seventy five yards away from his masters grave. He has his very own red granite headstone, which was unveiled by His Royal Highness The Duke of Gloucester CCVO, in 1981. Over the years films and videos have been made about this remarkable story, including a Disney movie, and an Edinburgh toy company came up with the popular Greyfriars Bobby toy. Guided tours of the kirkyard are given by a number of groups, including the Greyfriars Bobby Walking Theatre and the Greyfriars Kirkyard Trust. 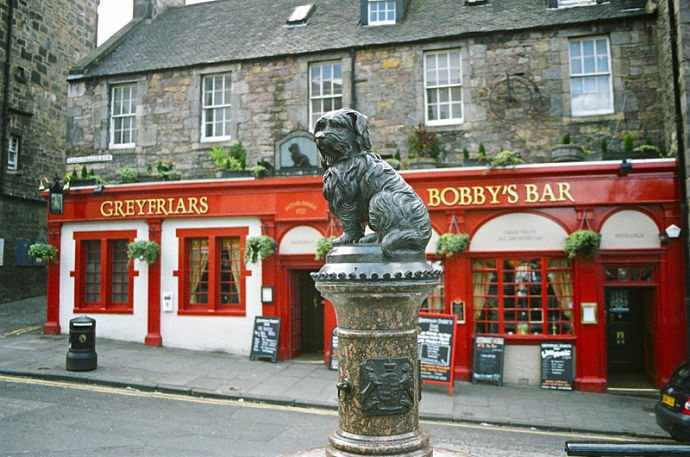 The statue of Bobby, beside the pub named “Bobby’s Bar”, is a well known tourist attraction, with visitors from all over the world coming to Greyfriars to learn his story and have their pictures taken beside him. (Some people rub his nose for good luck, but are now being asked to do it gently, as it has had to be restored twice). The City of Edinburgh is abundantly rich in culture and history, but surely there is nothing that touches the heart like the loyalty and devotion of this wee Skye Terrier. He is remembered to this day! See the Scotland Travel Information page for all the information you need for travelling to and within Scotland. 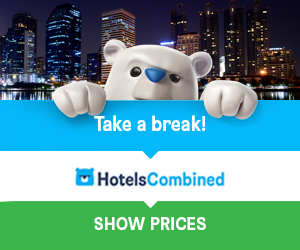 Helpful advice on passports and visas, currency, weather, holiday extras, some useful travel links and much more.